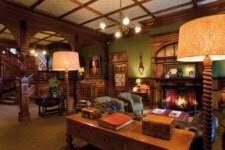 Otahuna Lodge, a seven-suite destination retreat located in the heart of New Zealand’s Canterbury region, offers unique residential style service in historical surroundings that evoke a romantic British colonial sensibility. Nestled at the end of a long meandering drive lined by stately oak, eucalyptus and acacia trees, the Queen Anne-style homestead is one of New Zealand’s largest private residences and has established itself as an iconic landmark, earning it a Category 1 Listing with the National Historic Places Trust. In addition, Otahuna’s 30 acres of land are recognized as “A Garden of National Significance” by the New Zealand Gardens Trust. Otahuna Lodge was originally built in 1895 and was the home of Sir Heaton Rhodes, a renowned politician. Today, over a century later, the property is owned by Hall Cannon and Miles Refo. They left New York to seek a new lifestyle and a more rewarding day-to-day existence. Considering the Lodge’s history as the residence of one of New Zealand’s most prominent citizens and the property’s status as an architectural gem, Hall and Miles had a vision to open an authentic Lodge that highlights the home’s legacy with features that showcase Otahuna’s distinct heritage. After purchasing Otahuna in mid-2006, Hall and Miles felt the estate needed to be updated and appointed New Zealand interior designer Stephen Cashmore, renowned for his work with historical properties, to renew the Lodge. While most of the original furniture disappeared throughout the years of successive owners, the spirit of the home’s unique history was maintained by incorporating new furniture and decor that tied into the property’s British colonial heritage. Hall’s passion for art inspired him to select the finest New Zealand pieces to create one of the country’s most significant private art collections, showcasing the combined influences of the landscapes, cultures and native peoples of the region. Thirty-five major works were specially commissioned for the Lodge, including art by renowned artists such as Peter Beadle and Craig Primrose as well as newcomers Mark Zhu, Peter Hackett, and Simon Edwards. The addition of these pieces has accentuated the original New Zealand Kauri and Rimu wood paneling of the Lodge. The Lobby, designed to blend a classic atmosphere with opulent sophistication, features hunter green walls, a wood-burning fireplace with leather furniture and plaid chairs, perfectly complementing the hand-carved staircase leading to the suites. The Drawing Room, featuring powder blue tones and a hand-carved fireplace mantel that is set within a hand-carved sideboard, was designed to reflect the motifs throughout the Lodge. Each guest room at Otahuna Lodge is unique, featuring its own personality based on the homestead’s history. 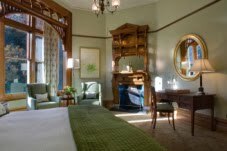 The Rhodes Suite, was once the master bedroom of Sir Heaton Rhodes, while The Clark Suite is named for the family name of Sir Heaton’s wife Jessie. The Verandah Suite, named for its 30-foot-long outdoor verandah, overlooks the property’s gardens and offers an optimal setting for couples to enjoy private dining. Sir Heaton’s favorite sport was played regularly on the lawn and gives The Polo Suite its name. The Botanical Suite features the New Zealand Silver Fern pattern, while The Butler Suite features Canterbury Art. The Garret Suite pays homage to New Zealand’s great outdoors with a rich sporting theme. Six of the seven guest suites feature wood-burning fireplaces, two of which offer a fireplace in the bathroom. In the evening, guests of Otahuna can expect a cookie jar that is replenished daily, as well as nightly turn down complemented by a chilled carafe of water and a bedtime story that depicts a true tale of colonial life at Otahuna. In order to provide guests with a truly historical setting and the opportunity to escape, televisions in the suites are available only upon request; however, wireless internet can be found throughout the Lodge. Among the gathering rooms, a cozy and well-stocked library of over a thousand titles invites guests to lounge on leather couches. The sophisticated Ballroom, boasting Cathedral-style ceilings and a wood-burning fireplace, seats 64 for dinner and is the ideal setting for private business gatherings, family dinners or intimate destination weddings. The formal Dining Room is highlighted by its original embossed green-and-gold wallpaper that dates back to 1895, along with a blazing fireplace and a built-in wooden sideboard. The Dining Room epitomizes the setting of a traditional New Zealand dining experience, which takes place nightly at Otahuna Lodge. Otahuna’s award-winning Executive Chef Jimmy McIntyre draws all of his inspiration from the property’s 19 acres of gardens, including an organic “potager” or vegetable garden, and orchard. Each evening, he creates a five-course journey that is accompanied by the finest New Zealand wines and a selection of cheeses. Guests are also offered the opportunity to harvest their own vegetables for the evening’s meal. There is also an opportunity to participate in private demonstration cooking classes taught by Chef Jimmy. The Lodge’s naturally lit Kitchen provides a cheerful setting for daily breakfast. Along with fresh fruit picked from the property’s orchard, a cereal buffet and freshly baked breads are offered. Chef Jimmy is available to prepare any breakfast craving desired, with eggs gathered each morning from Otahuna’s chicken coop. For guests that are interested in spending time outdoors, Otahuna Lodge provides a seasonal outdoor swimming pool and whirlpool, an outdoor fireplace and barbecue area, as well as a tennis court. The Estate’s former laundries, which feature the original copper and iron stoves, were converted into a gym facility and a massage suite, while the property’s original game house is now a wine cellar. Otahuna Lodge also provides travelers with the opportunity to experience New Zealand beyond the gates of the Lodge. The Otahuna team can coordinate excursions to the area’s most scenic gardens, New Zealand’s most celebrated wineries, the craggy Alpine peaks and glaciers of the South Island, as well as the virgin bush in the Waimakariri Gorge for fly-fishing. Otahuna Lodge evokes a romantic British Colonial sensibility through its historic Queen Anne architecture and intimate size. The 30-acre estate provides guests with the quintessential New Zealand Lodge experience featuring exceptional amenities, personalized service and uniquely memorable surroundings. Translated from the Maori language, Otahuna is a “little hill among the hills.” The seven-suite Lodge sits on a hill between the rocky outcrops of the Banks Peninsula, providing commanding views of the Southern Alps and the Canterbury Plains. Originally built in 1895, Otahuna Lodge served as the primary residence of politician Sir Heaton Rhodes for over 60 years. The property holds a Category 1 Listing from New Zealand’s National Historic Places Trust and is acclaimed as the best example of Queen Anne architecture in Australasia. Americans Hall Cannon and Miles Refo purchased Otahuna in August 2006. The Lodge opened in 2007 following an extensive renovation. Otahuna Lodge is a Relais & Châteaux property and a Virtuoso member.